After spending a lot of quality time with your iPad mini, it’s only natural that you could use a few helpful hints, tips, and shortcuts to optimize your device. Here’s a few to get your started. 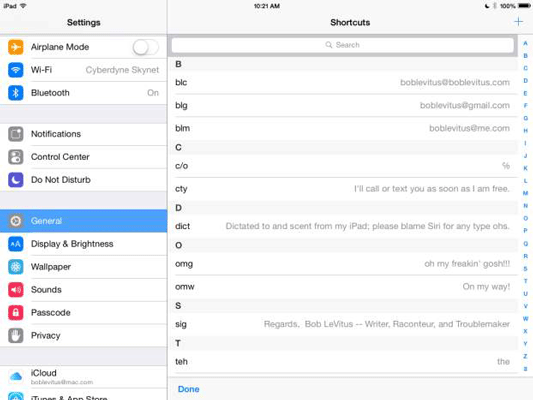 To insert a phrase, type its keyboard shortcut. First, know that you can type dont to get to don’t, and cant to get to can’t. Save time by letting the iPad’s intelligent keyboard insert the apostrophes on your behalf for these and other common words. If the autocorrection suggestion isn’t the word you want, finish typing the word and then tap the x to reject the suggestion before you type another word. 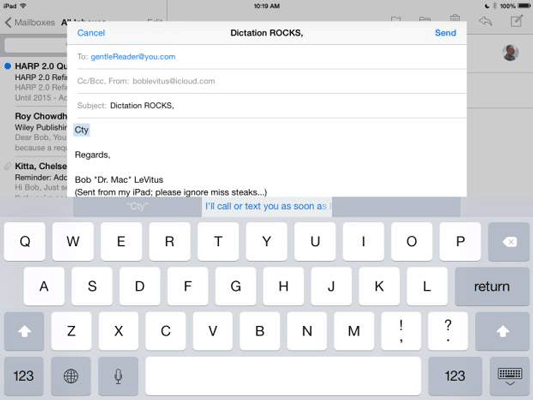 Doing so makes your iPad more likely to accept your word the next time you type it. If you hate it, here’s how to get rid of it: Tap Settings→General→Keyboard and tap the Auto-Correction switch to off (green). When your iPad mini is selected in iTunes, you see a colorful chart at the bottom of the screen that tells you how your media and other data use your iPad mini’s capacity. What you may not know is that when you hover your pointer over the chart, an overlay appears with the number of items of that type that are stored on your iPad mini, and how much space those items consume in megabytes (MB) or gigabytes (GB). So, you’re trying to find where you left off in your audiobook by moving the scrubber bar — the little red line representing the playhead — left and right. The only problem is that the scrubber bar isn’t precise. Just press your finger on the scrubber, but instead of sliding your finger to the left or right, slide it downward toward the bottom of the screen. 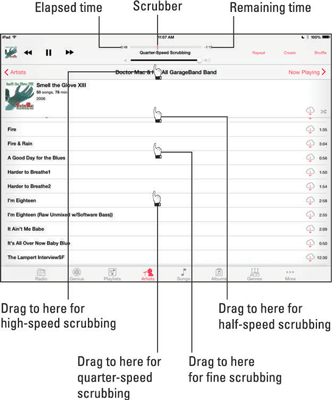 As you slide downward, the scrubbing speed changes like magic, and the scrubber bar moves in finer and finer increments to let you find exactly where you were. The speed is displayed below the scrubber bar. When the iPad encounters an email address in an email message, it makes that text appear as a blue link on your screen. If you tap that link, the iPad launches Safari or Mail, and starts a new email message for an email address or takes you to the appropriate web page for a URL. If you press and hold down on most images, a Save Image option appears. Tap Save Image, and the picture is saved to the camera roll on the Albums tab of the Photos app. The iPad makes sharing dead simple. From the site in question, tap the share icon. Then tap the Message, Mail, Twitter, or Facebook option to share the link via email, share the link via iMessage, post it to your Twitter stream, or share it on Facebook. 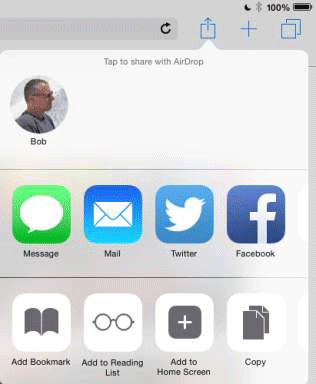 With iOS 8 and any iPad mini, you can also use AirDrop to share your link with other users. 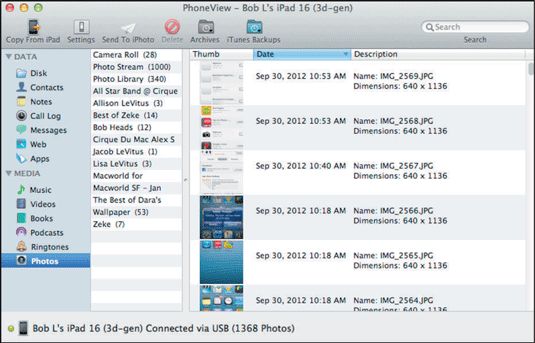 Ecamm Network sells a piece of OS X software, PhoneView ($29.95), which lets you copy files from your Mac to your iPad mini and copy files from the iPad mini to a Mac. To transfer files and folders to the iPad mini: Click the Copy to iPad button on the toolbar and then select the files you want to copy. To go the other way and copy files from your iPad mini to your computer: Highlight the files or folders you want to be copied and then click the Copy from iPad button on the toolbar. 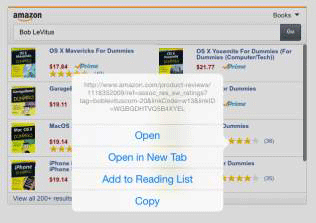 Select the destination on your Mac where you want to store the files, and then click Save. If you have an iPhone 5 or newer and any iPad mini and both devices are running iOS 8 or later, you have everything you need. To make a phone call on your iPad, just tap a phone number in Contacts, Calendar, or Safari, or tap a recent contact in the multitasking screen. If you meet the requirements and still can’t make calls, go to Settings→FaceTime and turn on iPhone Cellular Calls. Press the sleep/wake button at the same time you press the Home button, but just for an instant. The iPad mini grabs a snapshot of whatever is on the screen. The picture lands in the camera roll of the Photos app. From there, you can synchronize it with your Mac or PC, along with all your other pictures, or email it to yourself or anyone else.